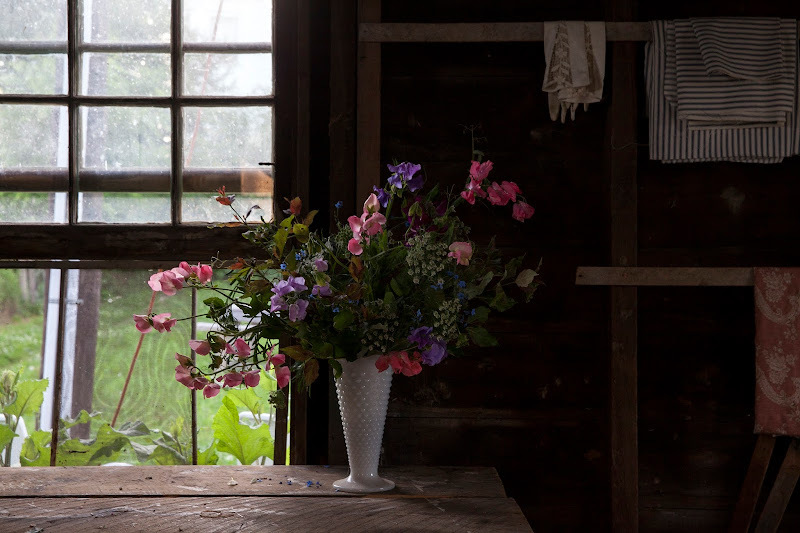 Photos of Lisa Przystup at Farmhand Flowers by Emma Tuccillo. 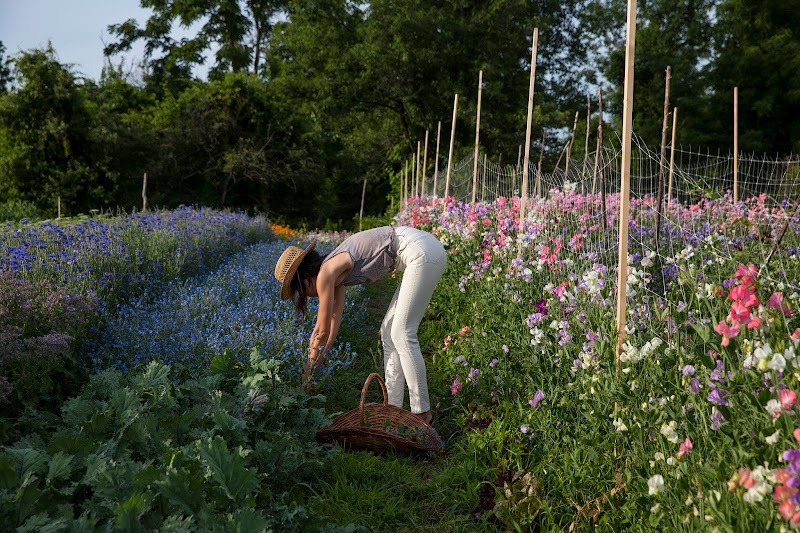 So excited to share this Q&A of Brooklyn-based florist Lisa Przystup of James's Daughter Flowers. Since I can remember, I've always loved flower shops. That wave of humidity that hits you when you walk in the front door, the fresh smell, the brown craft paper, the twine, the utilitarian boots, aprons, and pocket knives—all the cool gear that goes along with the trade. Lisa really knows how to put that all together into some fantastic tomboy style, and arrange other things too, you know, like flowers. If not in Brooklyn, I would live...somewhere in Upstate New York. My dream vacation would be to...have three months off to explore The West. To sit and be in one place in peace and quiet—just me, my man, and a porch somewhere with an uninterrupted view of the sky. If a dog showed up that’d be okay by me too. Food: Whole grilled trout with lemons, garlic, and rosemary. Grilled peaches with vanilla ice cream. Cherries. Music: My fiancé, The Bones of J.R. Jones just released his first LP, Dark Was The Yearling—I’m sure I’m biased but I think it’s damn good. Also: Hurray For The Riff Raff, the soundtrack to Ain’t Them Bodies Saints is emotionally epic in its sparse simplicity, I’ve also been listening to Sharon Van Etten’s song, Every Time the Sun Comes Up, Sylvan Esso is great summer music, and Neko Case, always and forever. Fashion: Any and all high-waisted jeans. 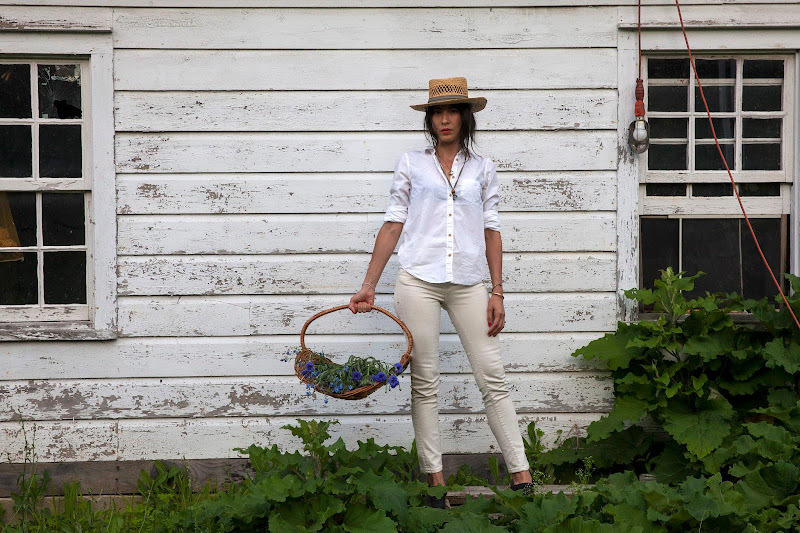 The perfect white t-shirt—mine happens to be worn to threads so I’m on the hunt for a new one. Woven straw summer hats (I hit a new low this spring and bought the same hat twice without realizing it). I’ve been stalking “vintage linen” on Etsy for easy summer dresses and have been dying to find a pair of high-waisted white linen pants. And clogs. Not sure if Dansko clogs count as fashion but I developed a dependence on them as a waitress and they serve me just as well as a florist—they are the ultimate in ugly comfort. Retail Stores: eBay and Etsy for vintage clothing and I’ve found some of my most favorite pieces digging through my mother’s closet and my old high-school wardrobe. There are so many talented designers and thoughtfully-curated boutiques like Need Supply Co., Mohawk General, Totokaelo, and Westerlind, that I find that most of my sartorial needs are satisfied with the click of a trackpad. I’m also lucky enough to have gotten to know some really wonderful local designers— my friend Ilana Kohn makes the best soft and loose tomboy-inspired pieces. I collaborated with Kalen Kaminski (one half of the Brooklyn-based label Upstate) on a shoot and fell in love with her stunning hand-dyed Shibori pieces. Other brands on my list: Mollusk, Jungmaven, No. 6, Steven Alan, Rachel Comey, and Madewell is practically a permanent tab on my computer. I channel my childhood self when I...watch fireworks. See a shooting star. The fictional character I most relate to is…Ferdinand the Bull. If I had to be outdoors all day I would...be happy as a clam. Beachside preferred, but I’ll take a quiet swath of green any day, all day. My favorite quality in a man is...the ability to make me laugh and a fierce loyalty. My favorite quality in a woman is...the ability to make me laugh and a fierce loyalty. I'm terrified of...bed bugs, flying cockroaches, and failure. My dream car is a...vintage Bronco. Or a vintage Mercedes Benz 450SL, whichever comes first. My cocktail of choice is...a Gin Gimlet in the summer, an Old Fashioned in the winter. My celebrity crush is...Ira Glass. My beauty product of choice is...Bumble and Bumble Surf Spray and chapstick. My friends and I like to...cook together and beach together. If I could go back in time for one decade it would be...I don’t do very well with change, think I’ll stick to 2014 for now. As a teenager I was totally into...Nirvana, The Catcher in the Rye, Christian Slater, feeling misunderstood, and buying Vogue against my mother’s will. I tend to splurge on...jeans, shoes, and travel. A heavy dependence on jeans and white t-shirts—that, and a sharp pair of clippers...is what makes me have Tomboy Style. omg can you please ask her what she's wearing? that's the perfect sleeveless/muscle tank! Do you know what brand her white high waisted jeans are? They're great! first picture: perfect outfit. so badass! Do you happen to know where her hat is from? it's lovely!